The French Tangerine: ~ mc laundry room? I'm thinking of sprucing up my laundry room. "Sprucing up" seems to evolve for me into a major project. At the start, when I say sprucing up, I mean to update the knobs. These white knobs seemed charming at the time, but several have broken over the last ten years, and they seem to disappear against the white cabinets. 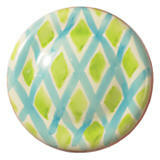 I love the idea of Mackenzie Childs knobs! Blue and white platter. .. How will that fit in with Mackenzie Childs? Or! What if I replaced the Quimper with Mackenzie Childs plates? I could even fill the bread rack in the hallway with tons of Mackenzie Childs! Do you see what's happening here? My brain takes this project to a stressful place. I don't want to deal and it gets put away for another time. Maybe I'll just wallpaper the walls? Literally, days after I worked on this post, my washer broke. It stopped spinning. It has been super loud for months and I knew subconsciously it was going to happen sooner or later. Sprucing now will be defined as a new washer and dryer! Well, no suggestions about the w/d. And I don't know about MC accents in this area. But I do know that I absolutely LOVE your hall and laundry room! These are the last places most people think to decorate; but yours are awesome! Hi Jan.....your laundry room is so pretty, doing laundry mustn't feel like such a chore. I think the MC knobs would be gorgeous, the colors are right and as is evidenced by pictures all over the internet, blue and white goes with EVERYTHING. Seriously......have yet to see a color it doens't work with! 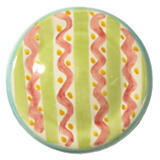 That said I could also really see blue and white porcelain knobs there, (goes great with yellow) I ordered some for a friends small kitchen (whose colors were white, blue and yellow) that I was helping her with and they are GORGEOUS! Heres the link.....go towrads the bottom of the page, think you will love them as an option.....let me know! I would keep the french country decor going in this room. 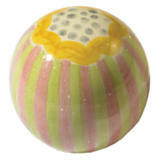 Have you considered oil rubbed knobs in the french country style? It would add another layer of sophistication to your home. I love my frontload Miele laundry machines. Our washer is also making that loud noise(same washer you have, I can see from the photos), the service guy said there is no point in fixing it so we are waiting for ours to conk out too. We have the Mackenzie ball knobs on white cabinetry in both our daughter's bath and one of the downstairs powder rooms, brought them to this house 10 years ago from our last house. I think the color palette is too pastel for French Country. Since I adore change, I say start fresh and redecorate! You can move all those beautiful accessories into other parts of the house. You are not only the queen of mosaics, you are the queen of great looking accessories. The bakers rack is styled beautifully. As is the rest of your home! Jan, NO, NO, NO do not change out the Quimper plates! They look great there (so would MC) but they just work with the theme, just my humble opinion. I don' usually like wallpaper but I love what you've done here. I think the only change you need are the MC knobs. I think they would be awesome on the white cabinets and give the room the pizazz you're looking for. I changed out the knobs on my french hutch (knock off MC, from Anthro.) I'm saving a pic of your laundry room, it is going on my wish list for my laundry room. I don't usually suggest decorating, especially to the Goddess of decor but since you have my dream laundry room I had to speak up, you did ask! HI Jan- Your laundry room is so happy and looks like a wonderful area for working away on the daily routines of laundry etc. I love all your wonderful pottery, tiles, Quimper plates and the bright yellows! 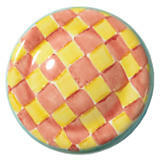 The MC knobs in the yellow/terra cotta check would add pop to your white cabinets & pull the colors and textures together! Maybe changing out one or two of the blue and white hung platters to MC designed plates/platters would also perk up the space. However, I would not add MC to you hall area. This space is just beautiful without the extra MC novelty feel. Your home is so warm and personal - you have such a good eye for color, scale and placement - Thank you for sharing! No suggestions from me, you have such a great eye that I know anything you do will look lovely. I love the wallpaper on the ceiling ~ and your beautifully styled bakers rack ~ and the brick floor ~ and the quimper plates and....just all of it! Thanks for sharing. Your laundry looks perfect in the photos.. but I understand the need to replace worn items. I'm sure that what ever you decide on, with regards to the type of hardware you use, will work perfectly. The French Country look is so colorful with lots of different textures, so you have lots of options. That hand-drawn picture is so sweet and I like all the colors, pottery, and plates you've added. Love your laundry room. How about an amber crystal knob? You can find them all over ebay right now. Might look really cool with the gold in the wallpaper. Just an idea! I made the mistake of buying one of those washers with the low water consumption feature. I'm 67 years old and perhaps been doing laundry for too many years but I can't wait to replace this #0!#^#0 washing machine. I understood the premise and appreciated low water use but the notion that clothes get clean in 4 inches of water is ridiculous. It's like the low flush toilets. True the first flush uses less water but if you have to flush twice to get the desired result, where is the savings? I am a big fan of front loading washers & dryers. I just put a Frigidaire set in our new house; this was the 4th set I've dealt with in the last ten years(moving overseas, 2nd home etc...). I needed something that wasn't monstrously large and I liked the steam feature. I've had Miele, Siemans & GE. I like the Frigidaire just as well. You could continue your counter, if it's Corian(?) over the top of front-loads for more folding space. I like that a front load spins so much faster that the clothes are practically dry before you put them in the dryer. I also hang things to dry. ~ For knobs why not continue with the black iron from the Baker's rack? It would certainly look French Country and you could add other black iron accessories to your already delightful mix. I can imagine a drying rack or hooks. I love the knobs that look like old woodstove handles. I love your Quimper plates!